Trolley tracks entered and exited York’s Continental Square in the heyday of York County’s far-flung street railways in the first third of the 20th century. A couple of weeks ago, I shared a note from reader Sis James, who was wondering about Bierman’s. Today, I have some information on that restaurant to share, as well as some memories of York’s former downtown streetcars, like those pictured. I hope you’ll enjoy them! Well, some digging and some help from eBay pointed me to an old matchbook cover for Bierman’s, advertising both ice cream and oysters, at West Cottage Place and Cleveland Avenue, just a little farther south than the Maple/Lafayette area Joan mentioned. There’s also (which I didn’t know until I started looking this up) an alley/small through-street officially known as Bierman Avenue that runs from West Cottage to another alley, Butler Avenue. A jaunt through the area didn’t turn up any street signs marked as Bierman Avenue that I could see, though I could certainly have missed one and would love to know if there are any! At any rate, I think that West Cottage/Cleveland location is our winner, Joan and Sis, and I’m so grateful to you both for sharing your Bierman’s memories! 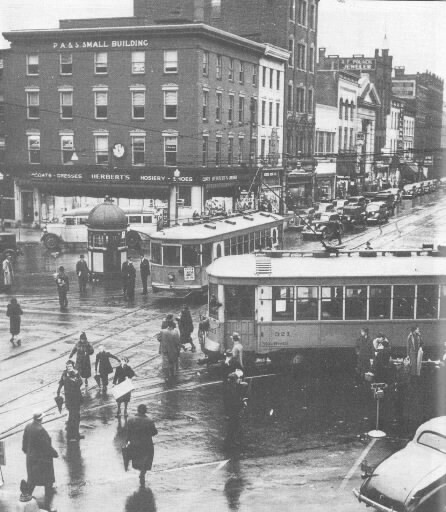 It’s been about a year since we last talked about downtown York’s former streetcars. Lester, I wish I could have seen those! I would certainly miss them too if I had grown up with them, I’m sure. I’m so grateful to both of you gentlemen for sharing those memories!